Jogja 4 Maret 2018 - Here is the whole coverage of the one day stick fighting seminar with the master himself, Harry Wibowo. Held last Sunday in the Empire Gym Jogja from 10 a.m-3 p.m, this workshop, surprisingly had more participants from out of town –such as Kebumen and Jember –with some of them having no martial arts background. Presented by mmaindonesia.net, this is our 2nd project after successfully becoming the host of around 40 martial arts practitioners from various backgrounds and styles in Indonesia in a gathering event. Some of the participants admitted that they were curious about the name Sindoro stick fighting, being claimed by Wibowo as something he developed on his own in the late 90’s in Wonosobo. Inevitably, questions about whether it is the same as any foreign stick fighting practices came up. And of course, the Master said ‘no’. By the end of the workshop, anyone could pretty much see it for themselves. Harry Wibowo -also called Ay, is a practitioner of many kinds of martial arts –learning Silat, Tae Kwondo, Kickboxing, Muay thai, and of course MMA since his junior high school days. 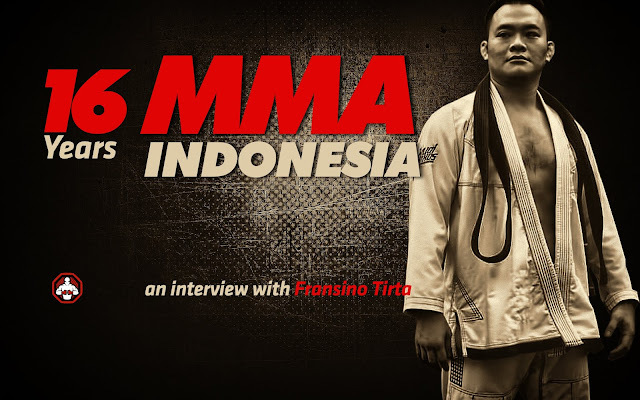 He is also founder of an MMA club in Wonosobo, but didn’t go through with it for a reason. That doesn’t mean you can doubt his commitment in developing martial arts though, because he is known as someone who wouldn’t think twice to do anything for the sake of martial arts. Back to the workshop, master Harry taught the whole techniques of Sindoro stick fighting, not only one or two practical stuffs. Aside from introducing what SSF is in general, he also gave us details about basic drill, striking and defense in stick fighting, striking area target, grip (which is an SSF signature, differentiating it from other stick fighting kinds alike), balance, footwork, BQ stick fighting "jurus", and other techniques such as locks and clinching in fighting using sticks. One of the most memorable style for me was the jumping stick with "Superman punch" style, while a few participants seemed pretty amazed by the Americana using sticks. Thank you once again for everyone who had helped made this event possible and to everyone for coming and learning stick fighting together –hopefully it could be beneficial for us all. Thank you Master Harry Wibowo and also BQ Fighting crew: Rama, Uci, and of course Niame.